Here now the 2nd form works mean that login form data's are validated and the codes given to execute login works perfect. But beneath it the register form background codes are not executed and no registration is done. I cant figure out why. The login button and textbox's works fine and no problem in it..
As far as I know, a aspx page can have only one server-side Form tag. All server controls are placed inside <form runat="server"> tag is to allow the WebForms engine to recognize them, load their values & save their values from/to the ViewState. Almost all infrastructure of control management in WebForms is based on the idea that a tag contains everything you access from the code-behind. I guess your 2nd form doesn't have the runat="server" attribute, so it will not fired the server-side event. 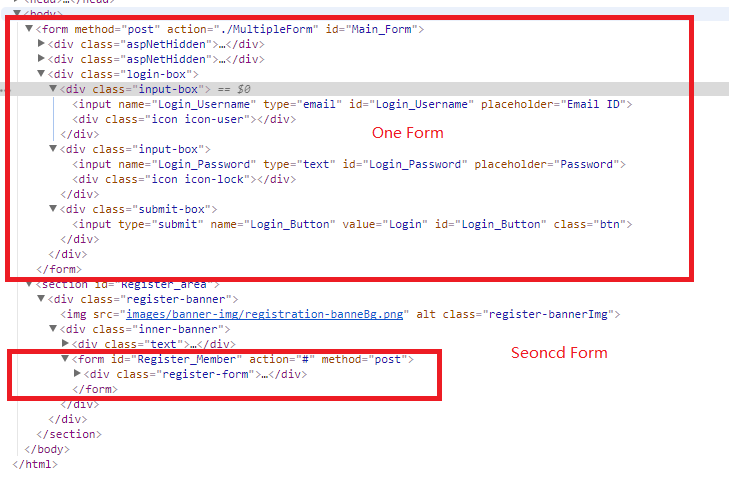 In my opinion, I don't suggest you use multiple form in one aspx page, you could create different button click event in the code-behind in one form. If you still want to create multiple form in one page. I suggest you could refer to this article. I know that one form is allowed in asp.net web form. But the validation of tools got mislead. if i don't use the form for both process Login and registration, If i click register button it validates the login textbox's too. Is there any way to avoid that. 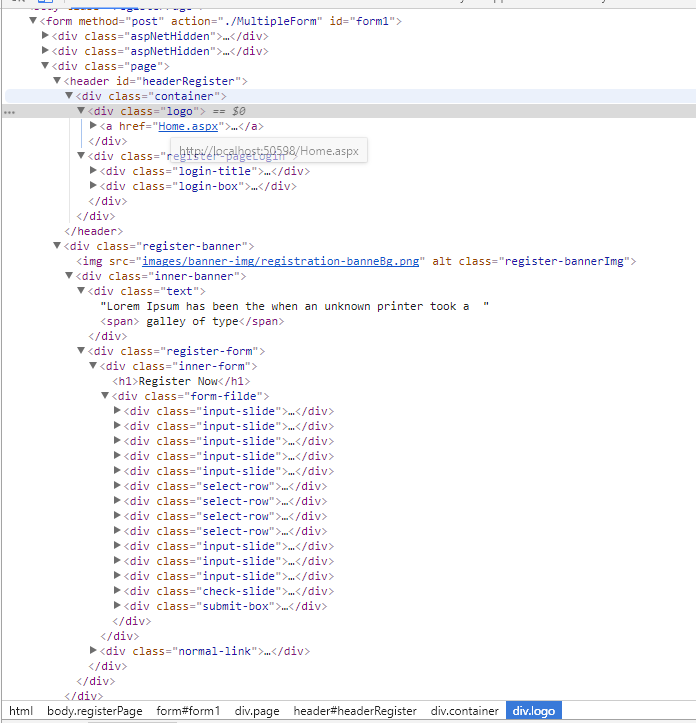 Like If i entire details to register an user then all the registration fields are filled then too it validates the login section textbox's. Any remedy to avoid that. Firstly, I suggest you not use nested form in your page. Because the html will not render the nested form. The nested form will disappear. Secondly, I don't see any codes related with validate. Could you plesae post the details validates codes? Do you use jqeruy or web form control to validate your login and register? Normally, we will use one page to login and another page for user to register. We could provide a link in the login page, if user wants to register we will redirect user to the register page. Sorry i edited the code and sent you. Nested from comes Inside of <Form id="main_form" runat="server"> 2 forms </form> With out runat="Server" from the control's will error. as in tool it self i given the validation. ./MultipleForm is the id of the runat="Server" form ? if i click the register button. Login_password,Login_Username also be checked if the null required warning pops up. As I previous reply said, asp.net web form will not render the nested form. So when you click the register button, it will still fired the runat server form1. The web page will check all the textbox in the form1. To avoid this, I suggest you could create a new aspx page to register. If you still want to show login and register in one page. You could consider using iframe.